The design team’s current thinking on hero cards. IGN: Before we dig into Zul’jin specifically, I’d love to know broadly what you’ve learned about designing hero cards – from the Death Knights through to subsequent cards and how that informs what you might do looking ahead. Peter Whalen: The biggest lesson I’ve learned about hero cards is that people love hero cards. They absolutely love them. When we did the Death Knights in Knights of the Frozen Throne, people really liked them then. We took a set off and then we brought them back with Hagatha [the Witch] and then Dr. Boom, [Mad Genius] and people really liked those cards. It doesn’t really matter how powerful they are, even the ones that don’t see a ton of play, like Death Knight Thrall, people still get really excited about. On the design side, some of the stuff that we’ve learned; the ones that tend to have infinite late game value with the hero power can be pretty frustrating to play against. Cards like [Deathstalker] Rexxar, or [Frost Lich] Jaina are really cool to do but they can feel pretty bad if you’re losing the game slowly over the course of 15 or 20 turns. That can be pretty frustrating. So we’ve tried to create less of that sort of repetitive long term experience. Hagatha and Dr. Boom both do very random things. 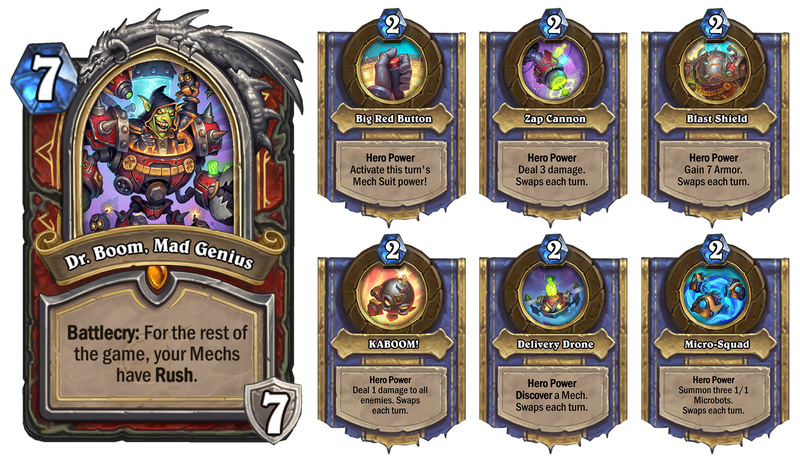 Hagatha generates random spells, Dr. Boom, his hero power is random, turn over turn, and the way that he generates value is also random – it’s discover a mech. Dr. Boom as a hero card, with a hero power that’s actually five hero powers. Zul’jin is actually a pretty different version of that. Instead of having a lot of the power loaded into the hero power, a lot of his power – 80 plus percent of it – is in his battlecry. And so his battlecry is this really powerful, over the top, crazy thing where he’s just this flurry of axes and kills all the stuff, summons a bunch of beasts, sets a bunch of traps, and then his hero power is pretty small. It lets you target your Hunter Hero power, basically. Zul’jin… a lot of his power – 80 plus percent of it – is in his battlecry. It’s useful… but we wanted to counteract that insane battle cry with a pretty tame and straightforward hero power. As for talking about some of the other versions of Zul’jin, that wasn’t always where he lived. But that was where we ended up, and we thought that was a fun thing to add as Spell Hunter has its last hurrah. This is the last expansion for when all of the Kobolds & Catacombs Spell Hunter cards are legal. So we wanted the hero card, if we were doing it in Hunter – because we wanted Zul’jin as this cool character – to make sense in that context. Peter Whalen: Oh man. We tried a ton of things for him… One of his battlecries was draw a weapon from your deck because he was this Berserker. And then his hero power was deal some number of damage, I think one damage, to any target of your choice. And whenever your hero took damage, the hero power would go up by one. So if you were Zul’jin, you were a Berserker, and if your opponent attacked you with seven Silver Hand Recruits, now your hero power is doing eight damage a turn. So that one is pretty nuts. Dean’s giving me a look – I don’t think that ever made it to final design, because that was pretty extreme. (Laughs) Yeah, so we can’t do that. Peter Whalen: In part. Also, because you were getting a weapon, you could kind of do it yourself, where you’re making sure your hero got damaged. We tried a couple versions of that where it was just the next hero power usage got the bonus damage as you took hits. We tried a version where it scaled over time, so each time you used it, it got stronger. All of those were okay, but they were kind of in the space where once you played Zul’jin, the rest of the game was just about, “Does my hero power get up to enough damage to murder my opponent?” And that feels pretty bad. That’s not the most fun gameplay when everything’s just about the hero power instead of the cards you put in your deck and how the rest of the game plays out. So we pivoted to try this completely different version of a hero card, where most of the power is in the battlecry. And we had the legendary minion “ten mana: battlecry – cast all the spells you cast this game” already. That was just a minion in the set. And one of the problems with that minion was you couldn’t put it in the Spell Hunter deck, because the Spell Hunter deck forced you to have no minions. So we put that on Zul’jin and it just worked. It made a lot of sense. Now you have your hero card, it recasts all your spells, that’s pretty cool, it’s not a spell, so you don’t run into this weird thing of your spell casting your other spell that casts all your spells. And you don’t have two copies in your deck. It’s just one Zul’jin. And we wanted the hero power to go along with that to be pretty tame because that’s a pretty extreme effect. And so we said, “Okay. Let’s let you keep your base Hunter hero power, but we’ll tweak it a little bit.” And so we just did, it’s throw an axe and you get to do two damage to anything. 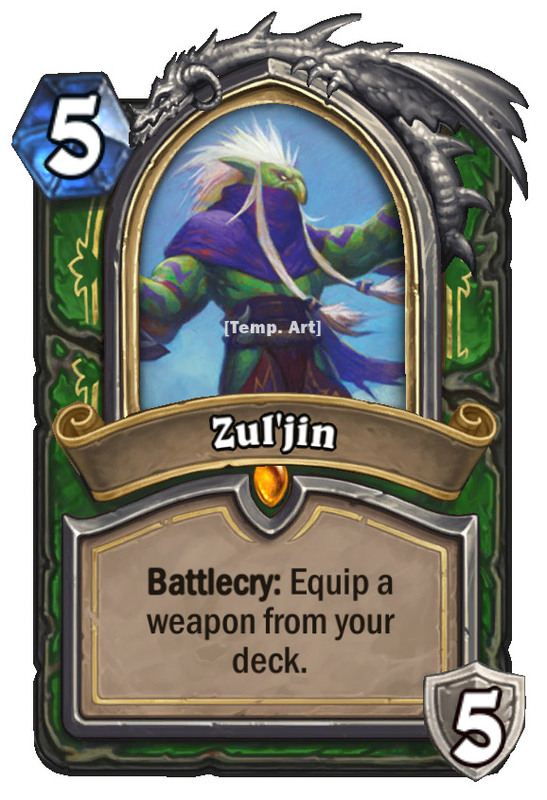 And then me moved into more – a lot like real life – value versions of it where we’re just putting it in these Spell Hunter type decks, except we were cutting some of the face damage parts that could backfire in exchange for more Crushing Walls type stuff that was more enemy focused and would give you better Zul’jins. And then – like in real life – we moved to the world where what if you just put Zul’jin in your deck and you put the good Hunter cards in, and sometimes it backfires and that’s okay. We’ll just play these cool cards. So I think it’s been fun to see the real world mirror our testing. And also the real world has done some different stuff as well, where there’s other versions of the Zul’jin Spell Hunter deck, the more mid-rangy hunter, where exactly does Zul’jin fit in the grand scheme of things? Peter Whalen: I think we’ll continue to experiment. We did nine in a set, and then we did zero, and then we’ve done one a set for three sets. I think there’s no intention of saying, “That’s the precedent. That’s 100 percent what we’re going to do.” I think we’ll just continue to experiment and do whatever’s right for the expansion in question. Cam Shea is Editor in Chief for IGN’s Australian content team. You want to check out the podcast he recorded with Hearthstone’s Creative Director Ben Thompson late last year. He’s on Twitter.